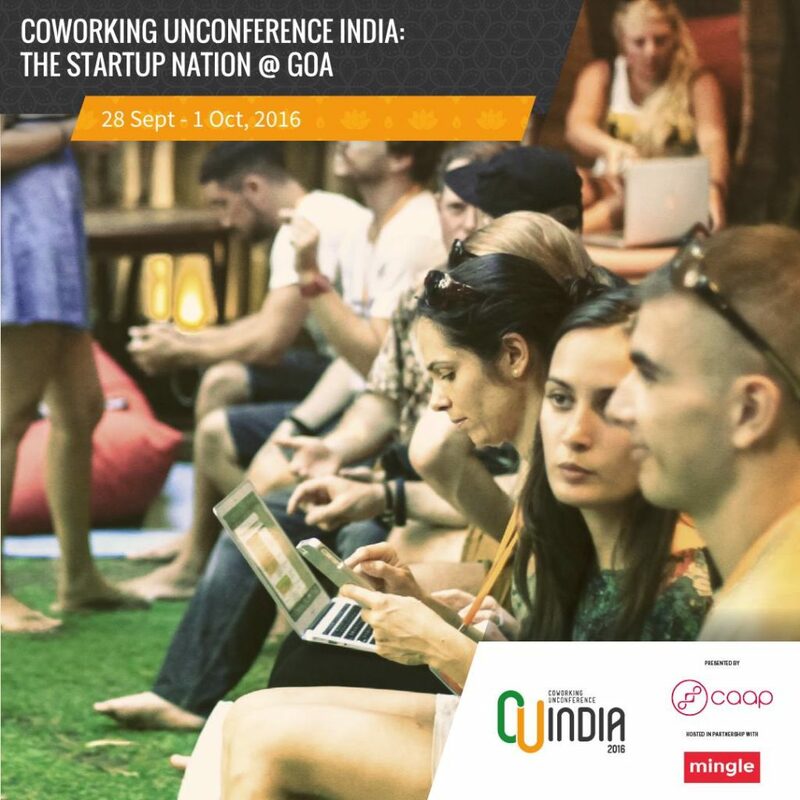 Coworking Alliance of Asia Pacific (CAAP) is set to bring the first Coworking Unconference to India. (CU India) on September 28 -­ October 1, 2016 in Goa, India. Kicking off with the theme “Startup Nation”, CU India is looking to boost support for the emerging startup scene in India, and the roles that the coworking movement has in supporting the growing ranks of freelancers, creatives, and entrepreneurs that are driving India’s growth into the new economy. 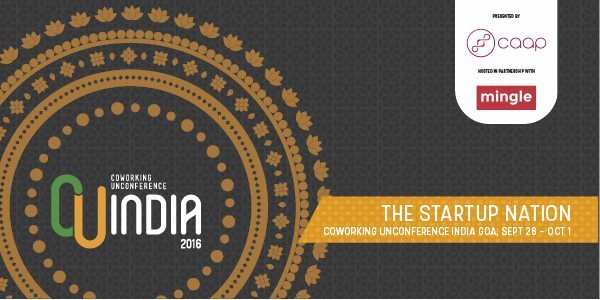 The four-­day conference will bring together all the prime movers and shakers from the world of coworking and innovation spaces in India. In the agenda is Coworking Academy, Keynotes and Panel Discussions, and Unconference Sessions where attendees set the agenda and discussions, allowing better dialogue and interaction. “The coworking movement and the tech industry are a natural fit. Coworking spaces provide the space, community and events that bring people together to facilitate collaboration and accelerated growth…acting as an anchor for the ecosystem. Bringing the conference to India reflects the emergence of the India tech scene and the ways we can support it with strong spaces and dynamic communities.”, explains Steve Munroe, the founder of CAAP and Hubud, Bali’s first coworking space. This year’s CU India is hosted in partnership with Mingle, a startup ecosystem which runs the oldest coworking space in Mumbai called Bombay Connect (since 2008). With roughly 4,200 startups currently being developed in India -­ eight of which are valued at over $1 billion -­ and an estimation of over 11,000 new startups by 2020, India is now the fastest growing Startup Nation in the world, second only to the United States. Fueling this dynamic startup scene is the rise of coworking and innovation spaces all across India. As Indians break out of traditional employment, they’re also breaking out of traditional workplaces -­ with the startup culture boom, creative coworking spaces are thriving. Earlier in the year, India’s Prime Minister, Narendra Modi launched the ‘Startup India’ initiative, set to further fuel the startup boom in India. This, will undoubtedly increase demand for coworking spaces across the country. India has more than 500 coworking and innovation spaces. According to the 2015 Deskmag’s Coworking Survey, India is also among dozens of countries where the demand for coworking spaces will grow exponentially in 2016. “The aspirational youth of India want to follow their passions and dreams, but they don’t always have the support systems, financial freedom or infrastructure to do so. Coworking spaces provide much more than infrastructure and affordable workspace. We build communities of like-­minded people, where one can meet, learn, work, and grow -­ together. We are one of the most important supporting pillars of the entrepreneurial ecosystem.”, according to Ashish Goenka, Managing Director of Mingle & Bombay Connect. We’re a team that is dangerously passionate about the coworking movement and are committed to help it grow and flourish into the entrepreneurial backbone of Asia Pacific. CAAP was officially launched in February 2016 during the wrap up to the Coworking Unconference Asia in Bali, which was created and hosted by Hubud: Ubud Coworking & Community Space. The alliance is formed to help coworking space operators learn industry-­leading practises and connect with each other while doing it. We do this through online events and in-­person meetups around the region. CAAP believes that the coworking movement is the future of working and learning spaces, and their growth is pivotal to social and economic progress. Mingle enables entrepreneurs, freelancers, investors, mentors, & creative souls to meet, learn, work and grow -­ together. We operate five coworking spaces in Mumbai, under the brand “Bombay Connect”. We run events and partner with accelerator/incubator programs to provide a learning platform for our entrepreneurial communities. Our vision is to build a global community of dreamers who will, go forward to co-­create businesses that will solve some of the largest problems faced by our world. To do this, we must, first and foremost “Mingle”.